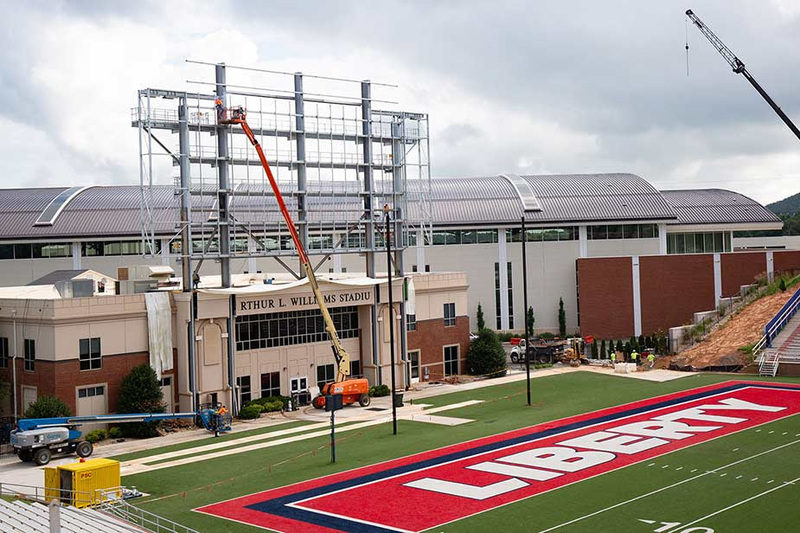 When Liberty University Flames fans return to Williams Stadium this fall, they will be greeted by new LED displays from Daktronics. The company designed, manufactured, and installed a new LED video display as well as a new ribbon display this spring in Lynchburg, Virginia. Construction of the LED display at Liberty University. The new end zone display measures approximately 41 ft. high by 74.5 ft. wide and features 10-millimeter line spacing to provide excellent image clarity and contrast to energize fans in every seat of the stadium. Industry-leading environmental protection keeps the display operating as expected as it informs and entertains fans, student-athletes, and coaches, alike. Along the seating fascia on the east side of the stadium, an LED ribbon display was installed. It measures 2.5 ft. high by 391 ft. long and features 20-millimeter line spacing to bring supplemental game information and graphics to the main display. It also offers the opportunity for sponsors to be highlighted throughout events. The end zone display is capable of variable content zoning allowing it to show one large image or to be divided into multiple zones to show any combination of live video, instant replays, game information and statistics, graphics and animations, and sponsorship messages. The project includes a new fixed digit scoreboard measuring 8 ft. high by 18 ft. wide to keep fans updated with the score, time remaining, quarter, and other standard football information. Delay of game clocks and backlit identification panels were also manufactured and installed by Daktronics. Liberty has partnered with Daktronics on multiple installations across campus including basketball, baseball, softball, aquatics, track, and soccer.